Croydon, UK, Nov. 26, 2014—Plymouth is using the latest mapping technology to prepare the city for major emergencies. Plymouth City Council is using a Geographic Information System (GIS) from GGP Systems to help produce emergency planning maps. The Council’s Civil Protection Unit has created the mapping for a range of exercises relating to a major incident in the city such as flooding, terrorist attacks or even a nuclear accident. Prepared for use in the event of a real life scenario, the maps are, however, vital for staff training and inter-agency coordination, and have supported the launch of a new warn and inform service for residents and businesses close to locations identified as possible high risk sites. “Although uncommon, major emergencies are inevitable fact of life. They can manifest themselves in many forms ranging from natural disasters, such as severe weather or flooding, to man-made incidents associated with commercial or industrial activity and even acts of terrorism and war,” said Scott Senior, Civil Protection Manager within the Civil Protection Unit of Plymouth City Council. “As a Unitary Authority with statutory emergency planning and community resilience responsibilities, we must respond in a rapid, effective, efficient and co-ordinated manner, whatever the emergency may be. 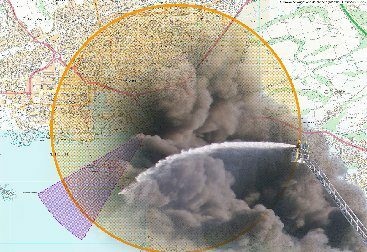 The primary function of GGP GIS within the Civil Protection Unit is to map public information zones around sites where a major incident could occur. These sites currently include oil terminals, fuel distribution centres, munitions stores as well as the Devonport Dockyard which berths and refuels nuclear powered submarines. The sites are analysed in GGP GIS and, using the Council’s centralised address database (Local Land and Property Gazetteer), individual properties that may be affected are identified. In the case of an incident these addresses will be issued with relevant information and will be the addresses the Council evacuates should the need occur.